When I started thinking about a hymn study for January I was looking at various lists of hymns for the ‘New Year’ and thinking that it would be appropriate to chose one of those hymns. I even started writing a post about one of them but it never felt quite right. Then I finally slowed down enough to listen to that still small voice and I kept hearing the words to this song in my head. It is a hymn that I love but do not often hear anymore. I pray that you enjoy this study this month and that it resonates in your soul. Shall We Gather At the River was written by Robert Lowry in 1864. He wrote the song based off of Revelation 21:1-2 where there is a description of heaven with a river flowing by the throne of God. I love the imagery and it makes me think of all of those who have gone on before me that are gathering at that river, singing praises to God. While the song and the verse are speaking of heaven I think it also reminds me to gather and slow down in the here and now. Life has a way of getting busy and chaotic and we need to ‘Be Still’ and spend time with the Lord. I have included several audio versions of the song as well as the lyrics and sheet music in the links below. There is also a free downloadable hymn study sheet and a free copy work to go along with the hymn. I pray that this song blesses you this month. Exciting news from All About Learning Press this week ! They are coming out with a full color edition of levels 1-4 All About Reading and to celebrate they are hosting a $1,000 giveaway! We use All About Spelling and are hoping to use All About Reading next year with my son who will be in Kindergarten. Join the FREE Get Active Inside Challenge! Over the course of 5 days, we’ll discover ways to allow physical activities indoors, get your child’s energy out when it’s too ❆ cold ❆ to go outside & keep your kids busy so they’re not bored and asking for cartoons. December is one of my favorite times of the ‘musical year’. I dearly love Christmas carols and the joy and hope that they bring to my heart. They are such a wonderful reminder of the love of Jesus. I love that I often hear them in places where you do not normally hear Christian music and I pray that they touch the hearts of those around me. When I chose the song, ‘O Holy Night’ to study I had no idea what the story behind the hymn was or why it was written. It is an interesting story as it was written by a man who later walked away from the church and the music composed by a Jewish man who did not believe in Jesus. O Holy Night was embraced by the church in Ireland when introduced in 1847. Shortly thereafter, the church’s opinion changed and the song was denounced, before regaining popularity a decade later in the United States. In addition to being able to read the story behind the hymn this month, I found a short YouTube video that shared the story. There are so many different versions of this song so I included links to a few below, including a fun Celtic version. As you take time to listen to the music this month I encourage you to take a few minutes and just sit and reflect on that night. The night that in many ways was just an ordinary night but that was also one of the most extraordinary nights in history. I broke up the copy work into six days instead of five because the lyrics to this song are a little longer than many of our hymns. In addition to our normal listening and copy work, I think that this free Christmas Star art lesson is going to be a great addition to our study. When I hear the words to O Holy Night it reminds me of the star that shone so bright that night. 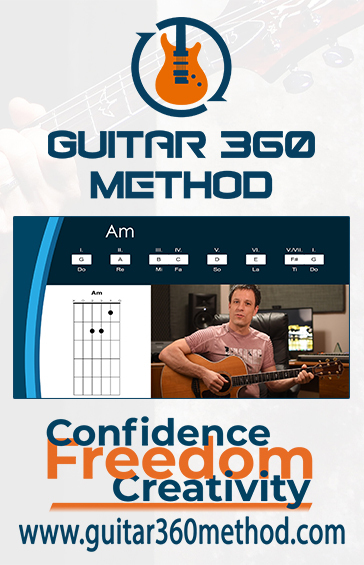 Guitar 360 Method (Review) and DISCOUNT CODE! Over the past month or so my twelve year old has been learning to play the guitar using the online Semester 1 Bundle from Guitar 360 Method. When my son was about four he wanted to learn to play the guitar and our wonderfully talented youth and music minister agreed to teach him. He enjoyed the lessons but refused to practice and so I discontinued them and the guitar has sat mostly unused ever since. My son had recently began mentioning lessons again but I was hesitant to commit to taking him to more lessons given our busy schedules and his lack of follow we saw last time. I felt like the scheduling concerns were addressed by using this online program because we could work the lessons into our busy and changing lives as needed. Music lessons are one of those subjects that I chose not to require in our home school. I know that different families have different areas of focus and for us music lessons are not a priority. We do incorporate music appreciation, hymn study, and this year a fun genre study into our everyday curriculum. Since we do not require lessons, but my son had been talking about wanting to try guitar again, I let him decide if this review was something that interested him. He was so excited to try it and I’m glad that I gave him the opportunity! While this was not his first time in classes, it had been seven years since he took them so we started him in the Absolute Beginner Course. He worked through that at his own pace. He enjoyed it and found that he learned new skills and brushed up on some other skills. At first we had a bit of problem with the videos not wanting to stream correctly (the sound would play but the video would freeze). We determined that the problem was that we were using an older computer and the videos were playing at a very high resolution. I’m glad we were able to easily solve that small problem by wsing a newer computer or adjusting the resolution fixed this issue and allowed for a much smoother practice session. The first day that he had access to the lessons he worked through multiple lessons in the beginner course because he was so excited. Throughout the rest of the review period he practiced four or five days a week, which considering our busy schedules during this time was an excellent accomplishment. He really enjoyed the chance to practice and learn each day. He worked through all of the beginner course and began the Semester 1 course. During that time he learned basic chords, strumming patterns, and even his first song. Each video ranged from about three to ten minutes in length making them very easy to fit into our days. However, I recommend making sure that your student also builds in some addition time to practice those skills in order to see the most progress. This program is not a subscription that you lose at the end of the thirteen week program so there is no pressure to rush through and finish ‘on-time’. Some of the lessons he picked up on quickly the first time through and he could keep moving forward. There were a few things that he needed to go back and work on but that was very easy with this program. He could simply watch that video lesson again and even pause and practice some more before continuing. However, I think that I let him work through those lessons a little too fast in the beginning with not enough practice and he struggled to put it all together. Learning an instrument is not like binge watching your favorite streaming program, you have to develop the muscle memory. Once I made him go back and master each lesson before moving on he showed a good deal of progress. Each week of the course includes a goal for the week and then various teaching and practicing videos. The teaching videos show a new skill or concept that they learn along with and then the practice videos are several minutes of work on the skills that have been covered. The course is a good mix of music practice and music theory. This helps with the goal of giving the musician freedom and confidence in playing and not just memorizing songs. We still have a long way to go to be finished with this course, which is a 13 week course not counting the Guitar Course for Beginners portion. However, at the end of the course my son should be able to play a variety of songs and chords and have the skills and confidence he needs to play well with a band or independently. He will understand the music theory enough to allow him to be flexible and adapt his skills to the situation and not just memorize chords. The instructor says that with mastery of the course a player would be well equipped to be a valuable player in a worship band or other similar setting. My son would really love to play well enough to be able to help out with our band at church. I was not sure that our family had the time or resources to give to music lessons during this time in our lives, but this program proved me wrong. The flexibility of the online prerecorded format and the short easy to follow lessons allowed my son to fit his lessons in around our other obligations. The program was fun, easy to follow, and allowed him to move at his own pace. This has been a very positive experience for us and we are excited to see how well he is playing when he finished the Semester 1 Bundle. 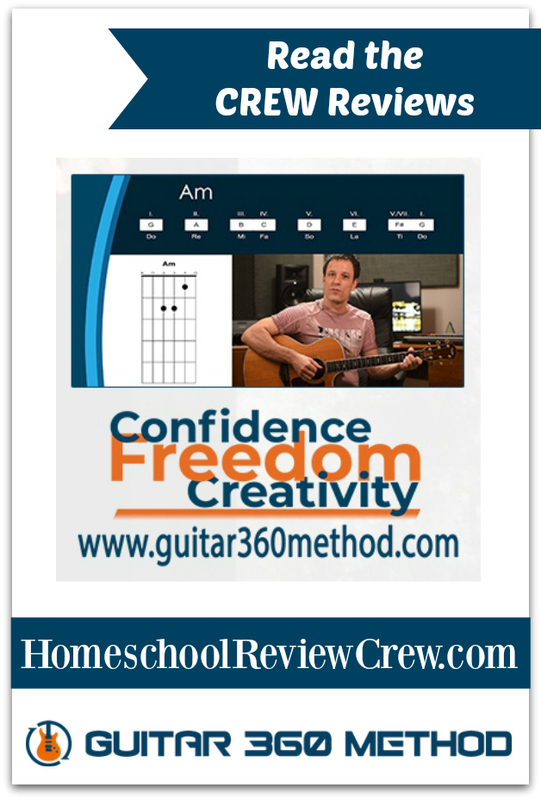 If you have a son/daughter who wants to learn the guitar, or even if you as an adult want to learn I highly recommend this program. I would recommend it for ages 10 and above. Check out all of the other Crew Reviews below to see how people used it in a variety of situations with a variety of ages. I can also offer you a 20% discount on this course using the code HOMESCHOOL20. The course was already significantly less expensive than paying for most private instructors and the 20% discount makes it an even more amazing value. This would be a great addition to your curriculum or a gift for that music lover in your life. As I sat down to decide what hymn to study this month I knew that I wanted something that focused on the concept of thanksgiving or giving thanks. We are called to be thankful every day but this time of year is a time when I like to refocus on all that I have to be thankful for. The day that I was researching hymns had honestly been a pretty tough day and it was amazing how much listening to all the songs of thanksgiving lifted my spirits. Our plan is to listen to a variety of versions of this hymn as an enjoyable way to become familiar with the words of the hymn. I will also have the children complete the hymn study fact sheet to learn more about the background of the hymn. Each day, for one week, they will complete the copy work pages for the hymn. Through these activities they will internalize the hymn in just a few minutes of work each day. If your family was musically inclined there is sheet music listed below. They could learn to play the song on an instrument of their choosing. We will also be combining nature study with our hymn by taking a hike and making a list of all of the blessings that we see along the way. We can remember how blessed we are that God gave us flowers to enjoy, trees for wood, birds to listen to, plants to eat, and all of the other wonderful things we find as we hike. In addition to our regular monthly activities I think this hymn and this month where we focus on giving thanks gives us a great opportunity to literally ‘count our blessings’. I encourage you to talk to your family and choose a way to list your many blessings. Some of you may be most comfortable with a private journal format, while others may prefer something more family oriented. You could create a thankful tree where the leaves each have blessings on them, a thankful pumpkin, or just a jar that you collect slips of paper with things you are thankful for. My daughter found a cute fall container and placed it in the middle of our kitchen table. Each day we all write down one thing we are thankful for on a sticky note. She wants us to take them all out on Thanksgiving and read them aloud to remind us of our many blessings. While we will focus on this hymn this month there were so many wonderful songs about giving thanks that I wanted to share more with you this month. I am including a list of songs with their links below in case you want to enjoy more songs of thanksgiving this month. I would love for you to share with me in the comments what song you think of when you think of giving thanks or thankfulness. Today (10/26) is the last day to get 40% off the Veterans Day Unit Study at Silverdale Press. Click the banner below and use code VET40. Stay Tuned for sales on their Thanksgiving Unit Study as well. I looked at the calendar earlier and realized how close it was to October. These past few weeks have been a whirlwind of activity from preparing for a hurricane to helping with relief efforts. I had not decided on a hymn for this month though I had a few options. I felt in my soul that I needed a song about storms. I needed to remind myself and maybe others of you that either went through Florence or are going through a figurative life storm that God will see us through. I asked on Facebook and received multiple wonderful options of hymns related to storms. It was truly inspiring to sit and listen to each one of them and I tried to decide which one we would focus on this month. I encourage you to take a few minutes and listen to those songs that were recommended. It was such an encouragement to me. I have chosen to study A Shelter in the Time of Storm by Vernon John Charlesworth this month. I think it really speaks to what I needed to internalize. There will be times of storm both literal and figurative in our lives but Christ is our shelter and our rock. We can depend on Him. Our plan is to listen to a variety of versions of this hymn as an enjoyable way to become familiar with the words of the hymn. I will also have the children complete the hymn study fact sheet to learn more about the background of the hymn. Each day for one week they will complete the copy work pages for the hymn. Through these activities they will internalize the hymn in just a few minutes of work each day. If your family was musically inclined there is sheet music listed below. They could learn to play the song on an instrument of their choosing. I know many people choose to do more than one hymn per month but this allows us to really learn the hymn as we keep going back to it each week. Next month I plan to have a hymn focused on Thanksgiving. I would love to hear about your favorite activities and ways that you incorporate hymns into your home school or family time. I have included links to the background information, lyrics and sheet music. I have also included free downloadable copy work pages and a hymn study fact sheet that can be used to write down what they learn about the hymn and its background. I pray that this song brings you the same peace and comfort that it brought me as I have been listening to it while I researched and planned for our hymn study this month. 25% off at Fit2B! We love their exercise courses as well as their course for girls! In the past we have focused our music appreciation on famous composers and studied a single composer for a semester or a year. While I believe these are valuable we wanted to do something a little different this year that would introduce the children to a wide variety of music and help us create some fun family memories at the same time. A little while back we were camping at a campground in Virginia and the folks next to us were playing some music that my husband and I had listened to when we were a little younger than we are now ( I won’t date myself too badly). The songs would come on and sometimes one or both of us would sing along because we remembered the lyrics even after all of these years. The children were amazed that we knew the words and wanted to learn more about the music we used to listen to. We realized that we wanted to expand their musical knowledge while still being careful about the language and content that we filled our ears and hearts with. So this year we have decided to choose a different genre of music each month. Throughout that month we will listen to a variety of songs from that genre and learn about some of the famous musicians. Whenever possible we will attend a free or inexpensive local concert related to that genre. I will mostly use music that is available from Amazon Prime or YouTube to make this an inexpensive study. Our first month we are starting with Bluegrass music! I know that it is not as popular or mainstream as some genres but I think it is so much fun. I love the instruments and the fun songs. Fall also tends to be a time when I can find more bluegrass concerts available locally. There are always several at our North Carolina State Fair and the apple orchard where we are hoping to pick apples later this month hosts multiple local bluegrass bands (among other genres). If timing works out we will hear a band at the apple orchard and if not we can catch a concert next month at the fair. I have not scheduled out the other eight months because we will use the availability of free or inexpensive local concerts to help with our scheduling. We intend to study jazz, classical, gospel, big band, classic country, blues, rock, and Celtic music. I know that there are many other genre’s and sub genres that we could have chosen but we felt that those included many favorites that we wanted to expose the children to as well as a well rounded variety. Each month I’ll share a short post with the genre we are studying and some free resources that you can use to share with your children. What favorite genres or musicians do you want to share with your children? Share your ideas in the comments!! Please check these before using with your children to make sure they align with your family. I have listened to some of the tracks but not all of them. Free 5 Day Learning without Worksheets Challenge: FREE 5-Day Learning Challenge We have done several of her different challenges in the past and they are lots of fun and easy to implement. 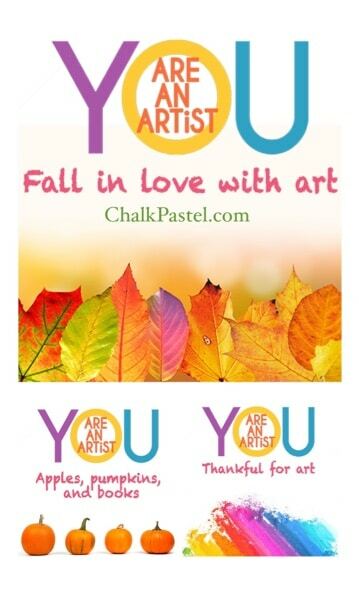 You Are An Artist Clubhouse Memberships are now Open for enrollment! and having a 25% off Sale through September 4th!! Apologia Digital Back to School Sale 25% off through 9/15! LAST Day for this awesome sale! New Kickstarter Program With Hoffman Piano Academy! Joseph Hoffman has always wanted one thing, for more people to be able to learn music and to love it while they’re learning. He spent years developing his own comprehensive piano method based on research in early childhood education and great music teaching methods like Suzuki and Kodaly. After receiving his master’s degree in music and founding a very successful music academy in Portland, Oregon, he wanted to find a way to teach music to children whose families might not be able to afford private music lessons, or who might live far away from a piano teacher. Five years ago, Joseph and his wife Kelly came up with the idea to create piano video lessons and post them online, for free, so that anyone in the world could learn piano with the Hoffman Method. To support their project, they sold downloadable lesson materials, like sheet music and audio files, to accompany the video lessons. Mr. Hoffman’s video lessons now have over 5 million views, with thousands of students watching lessons every day. But he’s not done yet. The Hoffman Academy team is also working on building a new, interactive, subscription-based website that will include music learning games and online progress tracking. Video lessons alone can’t give personalized feedback, but the new Hoffman Academy will be able to guide students through developing their skills in rhythm, staff reading, music theory, and ear training, and make learning the piano even more fun and engaging. Do you believe in music education for everyone? Contribute to our Kickstarter and help make it happen. Visit our Kickstarter page to learn more.